Welcome to my trip report on Vietnam Airlines once again! Initially I didn't plan to do a trip report since I have already covered on this aircraft 3 times but because I got the 2-class configured 787-9 for this trip, I decided to do a trip report. I had a scare at the counter. Why? Because I received a different seat number at the counter and I thought my aircraft was changed. My initial seat, I chose seat 42K and what came out on my boarding pass was 16K. After some enquiries about the it, the staff told me that my aircraft was changed (High hopes for the 777), nope, she told me it was an Airbus. My heart sank - in my mind, what?? A330 again ?? and she did a further check, it was Airbus A350. I wasn't too sure whether to be happy or to be sad. After doing some checks, VN-A887 was the only one heading towards Hanoi at that time, so I was happy to be flying on a different A350 and I had one more left to cover (VN-A888). 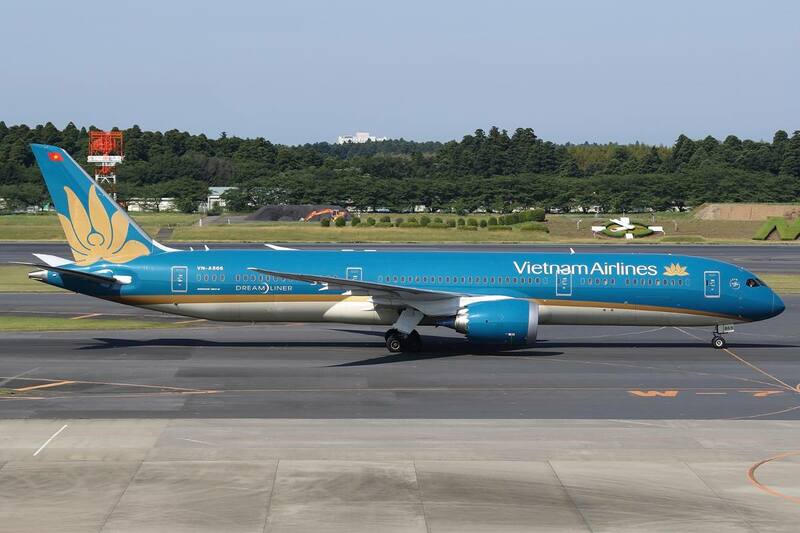 Earlier that morning, I was checking the 787 Dreamliner deployment, VN-A866 and VN-A865 were on their way to Hanoi and looking at the time schedule, I believed 866 would to be my ride to SGN and it turned out to be in the end. VN-A887 on its way to Hanoi. My mind was all set to fly on this aircraft. Looking at the seat map, I wondered what happen to row 10 to 15? Only after doing some checking, it was the 2-class 787 Dreamliner's configuration, I was delighted naturally. The seats at the front cabin were blocked so I picked seat 42K. If you booked yourself on Premium Economy on long haul flights like from either Hanoi or Ho Chi Minh City to London and get this aircraft, you won't be too happy being bumped into Economy Class. So now you have the idea of how the 2-class (Economy class seat map is like) There are only 7 rows of business class seats, I have no idea how the number system works when there are row 1-15 available. (7 rows only for J class) I suppose some numbers are skipped. Once that was done, I was ready for my 20th joyride on the Boeing 787 Dreamliner aircraft. I left the hotel at 11 a.m and took Uber to the airport. Taking Uber is cheaper than taxis in Vietnam but one major issue I encountered was they couldn't speak much English but most of them are competent. What I like about taking Uber is I need not explain to them where I am going, as the application would inform the driver and fastest route would be shown to him or her. At the Hanoi Airport for the 4th time, the airport has become quite familiar to me especially the domestic terminal. I went to do my check in and as mentioned earlier, my assigned seat was changed and was told that my aircraft was changed to Airbus A350. Once that was done, I went to Lucky Cafe 2 a floor above the departure hall to grab a bite. Someone checked in earlier than me! So for the 3rd time in the row, I didn't get my desired aircraft, the Boeing 777. 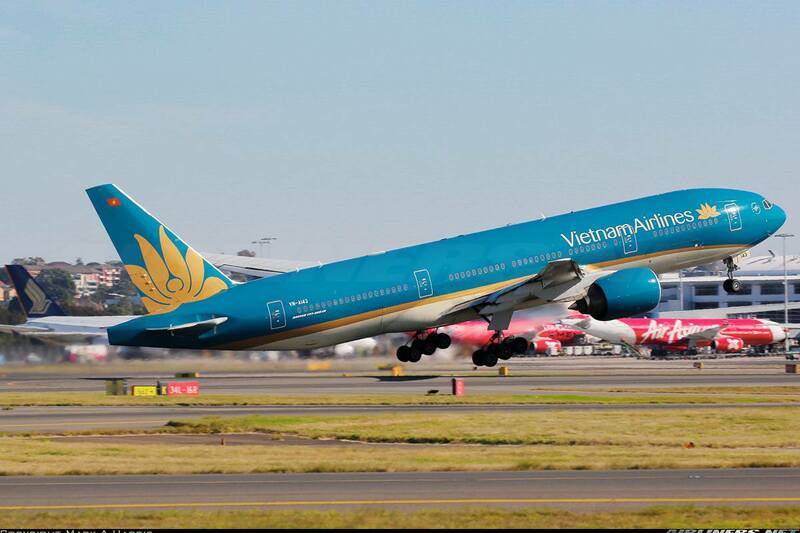 This aircraft type in Vietnam Airlines fleet seems to be avoiding me! 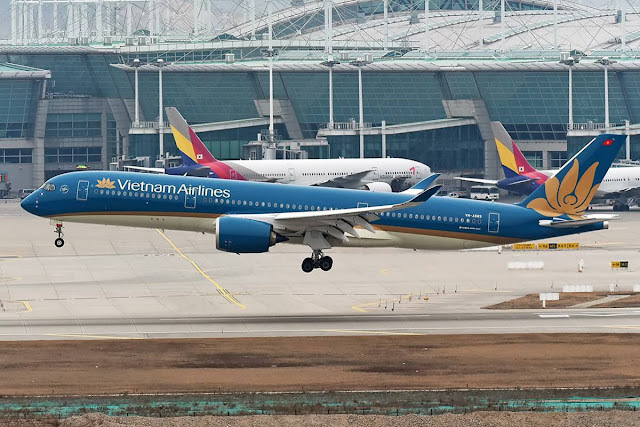 VN-A379, an Airbus A330-200. This aircraft flew me from Ho Chi Minh to Hanoi and it stayed here until then. After a long rest, it was being prepared for departure to Ho Chi Minh. The Boeing 787-9 Dreamliner aircraft on the left turned up to my aircraft. At that time, VN-A887 had landed and parked at the other side of the airport. Departure gate was at gate 3 and there wasn't any aircraft parking there, one thing for sure, my aircraft was parked at the remote parking lot. I saw the airline's Airbus A350-900 parking with the staircases attached to the door and I was pretty sure that was my aircraft. I saw this Boeing 777 being towed to one of the domestic gates. It was to fly to Ho Chi Minh City on an earlier flight. Tough luck for me. Once the bus started moving, I was surprised it was heading the opposite direction from VN-A887 (A350). There couldn't be another A350 at the airport and I got my answer not long after. 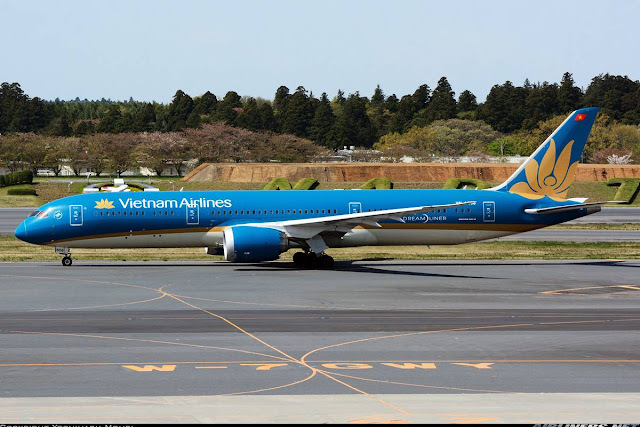 We stopped in front of VN-A866 and I got my 787 Dreamliner ride. I was wondering whether the staff made a mistake or the airline change my flight back to the 787. Whatever it is, I was delighted to be flying on the 2-class configured 787. If I was flying on the 3-class configured 787, this trip report would not exist. It is nice to board the aircraft this way as you can snap some photos. Do it discreetly and quick though. I was wondering whether I should board the aircraft from front or the rear, I decided to board from the rear. Greeted by a couple of grumpy looking crew, one of them gave me a surprised look and must be thinking why didn't I use the other door when my seat was closer to the front. I chose to board the rear so that I could take the cabin shots and spot any other difference between this and the 3-class configured 787s. Since only a few of us were on board the aircraft (the 2nd bus was still on its way), I went to the business class to take more photos. One of the crew thought I was self moving up to the cabin but I assured her that I wanted to take a quick look and would move back to my seat once I was done. The rest of the crew didn't look happy, sadly to say they made me feel depressed. The business class was quite empty when I took these photos. I wasn't sure the total number of J class passengers on this flight but one thing for sure, I certainly like to try this product. This was the best time to snap the photos. Taken from the rear. Won't go too much in details as I have covered this cabin product on the 787 on my previous trip reports. The best seat row for Economy Class - row 16. I was very happy with the seat. Unlike the other seats, the controller is at a different position (see the photo below) on the bulkhead rows. The IFE system (photo below)- don't laugh at me but I tried to take it out for photos purposes, but it just refuse to come out. I gave up after sometime, so no photo of it. Boarding the aircraft via the airport bus takes longer than boarding by the aero-bridge. This is pretty random, done by the operation side of the airline who decide which flights would use the aero-bridge, which flights would not. For late departure, aero-bridge would be used to save time. So for those who fly on domestic flights, be prepared for this inconvenience. It can happen to both Low Cost and Full Service carriers. The cabin crew on this flight were not friendly or bothered to smile especially when serving meals or walking past them. None of them looked interested in their job. As its similar to my previous flights, I won't go into details about them. As for my seat, all I can say is how much I enjoy myself. Good legroom space, excellent window view and it was a quiet ride in front. For the flight duration, it wasn't enough for me. I could sit on this seat for flight up to 15 hours, that shouldn't be a problem. We departed on time and took off quite powerfully into the skies, making a turn for the direction towards Ho Chi Minh City. This is my 4th HAN-SGN flight and its seems becoming a routine to me. The airfare I paid is much cheaper than flying on SQ's (Singapore Airlines) A350 to KUL or CGK and more flying time which makes it even sweeter. Unless I get a similar deal with SQ, I will wait for a while to fly on SQ's A350. The flight was turbulent midway through our journey and seat belt signs was turned on. The 787 battled well through the turbulence and looking at the outside, it was clear air turbulence, nothing much we can do about it. The strange thing is I dimmed the window but later on it brighten to original setting by itself. Probably the crew did something? I am not sure. For the rest of the flight, it was uneventful and we landed early at SGN airport. We stopped along the taxiway for about 10 minutes (I think it was because our assigned gate was not ready - an aircraft was still parked there and we had to wait for its departure before we could proceed) and taxied to our assigned aero-bridge. I won't have mind disembarking the aircraft by the old fashion way. No choice - sweet sauce sandwich with jelly. My seat mates skipped the meal, I should have asked him to give me his share. The light snacks were not too bad. There was no push back, engines were started and we moved off once we were ready and clearance given from the Airport Traffic Control. Taxiing to runway 11L, but we had to hold on near runway 11R to let an incoming aircraft to land. I was wondering, why don't they use 11L for landing and 11R for take off? Freebird Airbus A320 (operating for Vietjetair) was also heading to Ho Chi Minh City. It was a good day of flying. With the engine and wing view, I was able to snap many decent shots. Leaving Hanoi, but I will be back! Photos were taken in dimmed mode. I prefer this over the pull down shade. At least for this, you can still view the outside world even when its in the dimmest mode. Unfortunately the sun was facing my direction. Landing was a good one and we exited the runway, heading for the airport terminal. The cabin crew took a while to make the mandatory welcome speech, I felt she did it half heartedly. At this point, I felt sad because another great flight had come to an end, far too quickly for my liking. There was human traffic jam over here, waited for around 10 minutes before we could proceed. Finally, on my way out to the taxi stand. My ride, just arrived from Hanoi as indicated by Flightradar24. I may not have gotten the aircraft i want for the 3rd time, but at least it's something different, that's the consolation. Aircraft changes are part and parcel of flying especially on domestic flights, it happens more frequently due to operational reasons. So if you get yours changed, don't be disappointed, try again. Airfares on the domestic flights are inexpensive so for those thinking of trying, you should but beware of last minute aircraft changes. If you fly on business or pay for one of the most expensive fares in Economy Class, you can change your flight. Check the terms and conditions. Everything went well for this flight except for the in-flight service. This is my 14th flight with this carrier and so far only 1 stands out and that is this flight. Its a surprise now that Skytrax has upgraded the airline to 4-star airline. With this kind of service and the mixture of old and new products the airline is operating, I can't say that the airline deserves the upgrade. This airline should work on improving and polishing up the customer service (both airport and in-flight service) and also work on to minimise the aircraft changes especially on international routes. Domestic routes doesn't matter since its a short flight but if the airline has to make the changes, an email to notify the passengers would be nice especially for those booked on premium classes. I can really feel for those who booked themselves on Premium Economy Class and end up being bumped into Economy Class, if that happens, the airline should work a solution to compensate the passengers without making them more stress and possibly making them switch to other airlines. Hope you enjoy this trip report and thanks for reading! Good Trip report again. Strange the 2-Class has 2 extra rows in Y (Rows 49 and 50). Any ideas what is there in place of seats on the 3-Class. Toilets over there. It feels like a cattle class at the rear cabin!